A laptop in for repair had stopped working 'after something was spilled on it'. Oh dear, looked fine from the outside, but inside it wasn't a pretty site. 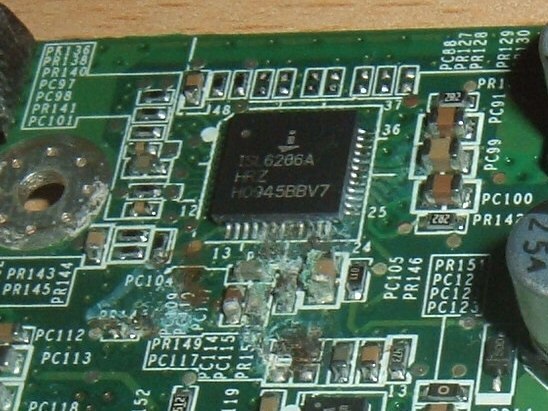 The battery had been left in, and power had been applied and the motherboard looked like an example of electrolysis in action. There was much corrosion around the power input and charging circuits. Anything which had a decent voltage across it had suffered. Some was just superficial staining, but several places the pins and tracks looked to be corroded away. Not much hope here I am afraid. The moral of the story here is if your laptop does get wet, take the battery out and unplug it until it has thoroughly dried out.